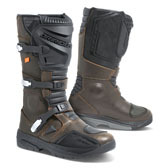 - Adjustable Buckle & VELCRO® closures. - TPU gear change pad. - Reinforced heel & toe area. - All terrain vulcanized rubber sole. - Moulded shin plate protection.